Lots of people go on skiing holidays at this time of year, and the vast majority are purely downhill or alpine skiing, where you queue up at the bottom of a ski lift, get pulled up a mountain side and then ride down it, only to repeat the whole thing over and over. A bit like riding a rollercoaster I suppose. Cross country skiing is different. 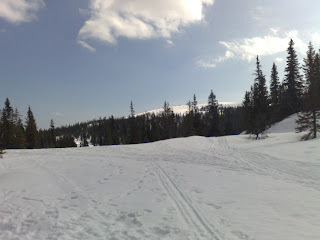 Firstly, you have to ski up hills as well as down them. Secondly the skis are longer and have different bindings - you're only fixed at the toe which apparently makes them harder to control but safer in terms of not breaking your leg or tearing your cruciate ligament. 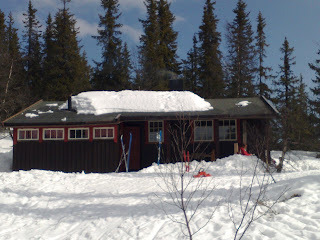 We stay in a cabin about 900m above sea level in the Numedal region of Norway, just outside the town of Veggli. It's pretty basic, with no mains electricity, bottled gas for cooking, a wood burning stove for heat, water from a well and a composting toilet. The cars are parked about 400m away down the hill, and on arrival you have to do several trips up on your skis with rucksacks full of clothes/food/booze. Virtually impossible to walk up as the snow is about 4ft deep and you just sink up to your thigh. Kids had a great time. The big two are pretty good on their skis now, and even Sophie at almost 4 years of age had a go. We built an igloo that stood for all of 5 minutes before collapsing for no apparent reason (wrong sort of snow probably), and several snow men/cats/chickens!